Study these two photos. 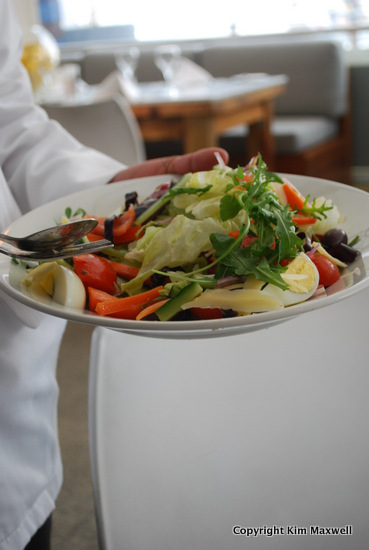 A waiter dressed in a white overall-jacket showing off the signature chopped salad for two. You just know, before it happens, that you’ll be served at the table. Then the bouillabaisse arrives, ladled individually from an old-fashioned soup tureen. At Seelan restaurant that’s the direction in which your meal is headed: retro outfits, old-style service, solid and fairly simple, retro food with flavour, freshness and modern twists. I dined, by invitation, on a few menu signatures at Seelan restaurant in June. If it seems odd that a 120-seater in prime waterside position at the V&A Waterfront opening in April 2014 can already have signatures, it’s because chef-owner Seelan Sundoo has fine-tuned his style while being employed at other venues. The Grand, The Reserve Brasserie and Shimmy Beach Club – not places I’m overly familiar with because they’re more about the place than the food – but I definitely recognised a stamp on Seelan’s plates from his time at old-style retro Italian, La Perla. Many of those customers have followed the chef to his new home. What might you enjoy? 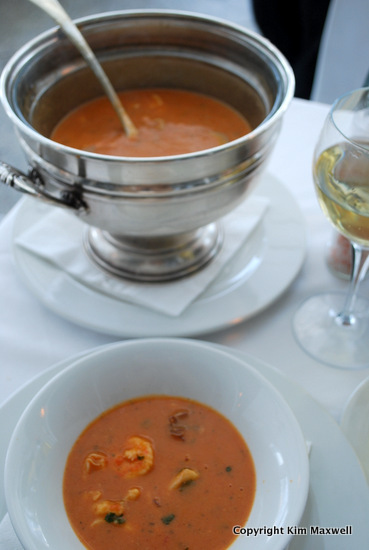 The bouillabaisse starter (R95) is a comforting, slightly creamy tomato-rich version – not the heavy garlic-and-saffron kind – that’s plump with prawns, white fish and calamari rings. The tagliata comes in a sliced fish or steak version (R160). I requested kabeljou instead of bland kingklip. It’s served with a pleasant soy, sweet chilli and ginger sauce, then goes fusion with rocket, sundried and regular tomatoes, plus Parmesan-style cheese shavings on top. The sirloin tagliata version is tasty too – partnering chanterelle mushrooms, cream and truffle oil. But I can’t help feeling both dishes would benefit from a little less sauce and topping elements. 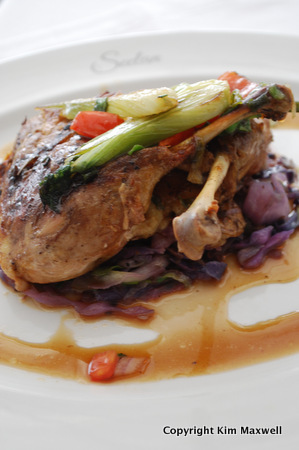 Worth eating also is the half rotisserie duck (R165) served with either an Asian BBQ sauce or an orange sauce. The duck was expertly roasted with crispy bits, although I found the orange sauce overly sweet. The rest of the menu offers assorted pastas (R80 to R95), various creative salads (R65 to R80), prawn or lamb curries (R135 to R145) and grills including steaks and rotisserie lamb to veal chops. Side dishes cost extra, and there is some scary pricing in the seafood direction, but then crayfish, langoustines and platters will do that. I fall into that category of Capetonians who ordinarily leave touristy Waterfront restaurants to the foreign guests benefiting from a great exchange rate. But as a local if you do fancy a smart-casual lunch with an enclosed terrace harbour view and don’t mind paying a little extra, you can order a decent wine by the glass (I drank Vondeling Chardonnay), experience attentive service and eat very well at Seelan. Just don’t be surprised to see a dessert trolley being rolled in. SEELAN, Shop no. 8, Quay 5 (near Sevruga and opposite the pirate boat), V&A Waterfront. Tel 021-421-4906. *I haven’t tried it but as part of the V&A Waterfront’s winter special Seelan is offering three courses for R180 (Mon to Thurs lunch or dinner). 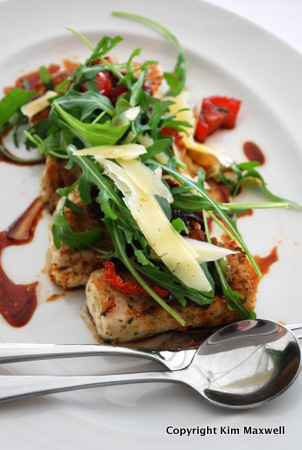 Or a six-course tasting menu for R380, including a wine tasting per course (Mon to Thurs lunch). Thanks for sharing this food!